Home > Considerations > Should I Live Near My Family? Love them or loath them, your family can play a vital part in your retirement and living near to them can be mutually beneficial. You may not have thought about the importance of having your family around you before reaching retirement, but things can change when you reach a certain age, and it could be that moving close to your family is the best option. Do You Need To Move Closer? The idea and the reality of living near to your family can be too very different things. Now you have retired you may start to notice the absence of your family more than ever before. If you do move though it should be for the right reasons and not a knee-jerk reaction. It sounds obvious, but the first question you should ask yourself is do you like your family and would you enjoy living close to them. Friends and neighbours are increasingly playing the part of distant families nowadays, so it is not always necessary to have them close by. The decision should also be a mutual one between you and your family, they might want you to live close by but you are not so keen on the idea, or vice versa. One of the advantages of living in a technological era is that even though your family lives thousand of miles away you can still talk to them online or over the phone. They can offer you support and company if you do not have friends close by. 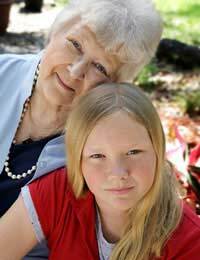 You get to see your grandchildren and your children on a regular basis. You can turn to your family if you need help with odd jobs such as the shopping and doctor's appointments. It could also save you money moving closer to them as it will save you going to visit them regularly. You may not always get on with your family. You could feel like a burden on your family if they are not used to having you around. You may have to move away from your current friends and neighbours in order to be close to your family. It could cost you a lot of money and up sticks and transform your life to be nearer to your family. In the same way as you would rely on them they might also start to rely on you and you might find you lose some of your independence. Health worries can play a big part in your decision to move closer to your family, If you have a few health problems it can be nice to have support around you from your family. You should also look to the future and whether you think your health will cause you any problems. If you are a healthy independent person you might not need to worry about your health at the moment but if this becomes a problem in the future it is better to move sooner rather than later. One of the biggest reasons people are eager to live near their family after they retire is simply because they want the comfort of knowing they have family close by and can call on somebody if they need help. If you don’t live far away from your family you may want to weigh up the pros and the cons of moving nearer to them. It might be better for you to see them on a regular basis instead of every other day. You should also keep in mind that you might have quite a good and enjoyable life already and you might not want to give that up. For some having their family near can make life easier and more enjoyable in retirement, for others though they are happy to see them only once in while. You need to ask yourself whether you need your family close or it is simply that you want them close. If you do plan to move to be nearer them it is also important to ask them how they feel about it and make sure they are happy with the arrangement. One of the advantages of technology is that it is now possible to speak and see your family every day, even if you are not in the same room. If you don’t want to give up your way of life but still see your family it might be better to increase the number of times you meet up or speak on the phone. You will have to decide whether the pros of living near your family outweigh the cons.